In the food and beverage industry, having dry space to store non-perishable items is important. For example, restaurants tend to go through large amounts of commonly used drinks and foods like wine, condiments, and pasta each week, as well as non-food items like napkins and cups. Instead of ordering in smaller amounts or cluttering up an already crowded kitchen, steel shipping containers can be used for safe storerooms. Steel shipping containers are designed to cross oceans, where they face a great deal of wind and water. As such, each steel shipping container is certified to be wind and water resistant, meaning that you don't need to worry about the environment in the container becoming wet, moldy, or mildewy after a storm. Humidity or moisture (even with non-perishable food items) is a recipe for disaster, and Conex boxes are one of the most effective ways to avoid that problem. If you live in an area with very hot summers and have some items which respond poorly to heat, you can opt for a Climate Controlled Storage Container. Falcon Structures' climate-controlled containers are designed for use in extreme climates. Each container is equipped with an HVAC system, which regulates the temperature and humidity. In addition, steel shipping containers are effective for light-blocking storage, which can be important when storing certain liquids such as olive oil and wine. Steel shipping containers are extremely secure. No one but authorized members will be able to access interior contents, so you'll know your items are safe. In addition, steel shipping containers help to keep out vermin and rodents, a key consideration for anyone in the food industry. Steel shipping containers are extremely efficient at keeping out anything that needs to stay out, such as water, pests, and heat. At the same time, the interior can be designed to meet each restaurant’s individual needs, so that all of the items stored in the container are easily accessible. 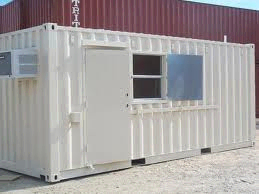 Interested in using a modified shipping container for your restaurant's storage needs?